Natural disasters have affected more than 200 million people every year since 1990. Globally, the rate of natural disaster events has gone up by 400% in the last 20 years. On an average, in the last 30 years, more than 4,600 people have died annually due to some sort of natural disaster. The impact of natural disasters is felt even harder today because of overcrowding and less open spaces. But who has time for the changing climate or showing concern towards the consistently dropping water table anyway? Everyone is so busy and is getting late for work, or something like that. Once upon a time, monsoons in India were associated with fests, sweets, kheer and regarded as a season of love. But since the last decade rains have become a death knell of disaster and possible disruption of life as we know it. Last week, more than 100 people lost their lives due to floods and landslides and nearly 2,15,000 villagers lost their houses to floods triggered by heavy rains. Manipur, for instance, is facing the worst flood that has ever taken place there in the last 200 years! Assam is frequented with floods but the intensity and the damage of the floods is increasing with each passing year. And this is just the Eastern part of the country. Similar fate has fallen upon most other states of the country. Ill timed rains have damaged 1.83 crore hectares of crops across 13 states leading to an unprecedented increase in our wheat imports in the last decade. 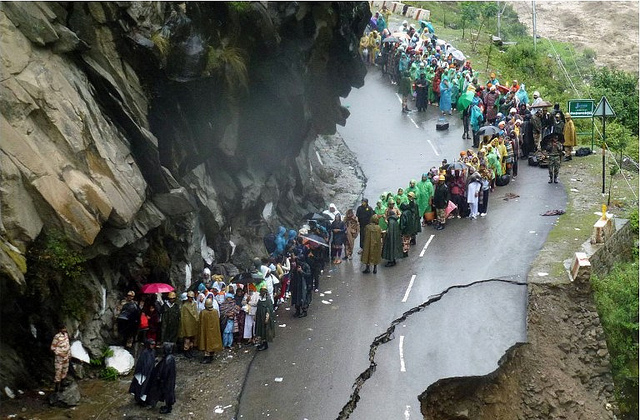 There has been a four fold increase in number of landslides in Himachal Pradesh in less than three decades. Gujarat, Rajasthan and Madhya Pradesh are facing floods and washing away of roads and railway tracks by the rains. When the rains come, they reclaim the soil and land and wash away our roads and houses. Mumbai has already become infamous for turning into a swimming pool during monsoons. Delhi is not far behind, with water logging being reported from most parts of NCT in every recent monsoon event. Cloudbursts in parts of Himachal Pradesh and Uttarakhand have become a huge source of worry for policy makers and local population since the last two decades. Maybe the Indra Devta is angry at us Indians for being too snobby. Or maybe it is the impact of climate change coupled with poor natural resource management and unplanned infrastructure development. All evidences and reports point at the latter. In a rampant chase to be labelled developed, we have recklessly constructed buildings, roads, railway tracks, malls….the list goes on. This has happened at the expense of previously open spaces, wetlands and trees and forests. It takes no mastermind to realise that all water logging cases are coming up because water cannot find a way to reach the nearest depression or pond/lake. Further, the ponds and lakes have themselves are becoming extinct and no ground water recharge is happening. There is a dire need of urban planning, so that enough open spaces are left which can temporarily hold rain water and allows it to recharge the ground water. Open spaces such as parks, ponds, playgrounds are a must where water can be allowed to stand for a few days without causing inconvenience to local population. The Kedarnath disaster in Uttarakhand caused more damage than was anticipated because of the construction of buildings and other permanent structures too close to the river. So when water in the river increased, it took away the land it rightfully owned – causing huge destruction in the process. All these (relatively) recent and hastened processes aren’t natural disasters. They are natural events which humans got right in the middle of! We need to understand why we are facing such extreme events in such a short time span. Lastly, looking at the climatic causes of such extreme events, yes, global warming is a part of the problem. With the constant rise in global temperature and atmospheric CO2 several other factors have reacted adversely. Most notably, the recent (in order of 10s of years) fluctuations in monsoons and ENSO (El Niño Southern Oscillation, which is an ocean process controlling the temperature, monsoons, land heating, droughts – basically a very strong and important process) have caused most of the financial, economic and social losses to communities and government alike. But global warming is not the sole culprit. Earth’s processes move in unison. It has a well knit balance between its various systems – forever working to keep a balance and ultimate peace on itself. In the 0.4% of time humans have lived on Earth, we have managed to overturn this delicate system, unknowingly digging our own grave. Think of it like this: global warming can take as long as your spouse does to cool down, and effects may stay for centuries. You don’t want your great grandchildren to think that you are bluffing when you tell them glaciers did exist once-upon-a-time, now do you? Is sustainable development not possible? Why can we not make peace with the Nature? Simran Arora is pursuing her Master's in Earth Sciences from the University of Delhi and is an aspiring climatologist. The destruction of ecosystem by man will have some obvious impacts on man himself. Good to see this article.